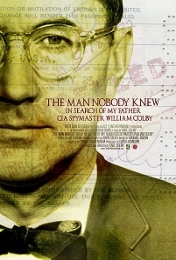 A son’s riveting look at a father whose life seemed straight out of a spy thriller, THE MAN NOBODY KNEW: IN SEARCH OF MY FATHER, CIA SPYMASTER WILLIAM COLBY uncovers the secret world of a legendary CIA spymaster. Told by William Colby’s son Carl, the story is at once a probing history of the CIA, a personal memoir of a family living in clandestine shadows, and an inquiry into the hard costs of a nation’s most cloaked actions. From the beginning of his career as an OSS officer parachuting into Nazi-occupied Europe, William Colby rose through the ranks of “The Company,” and soon was involved in covert operations in hot spots around the globe. He swayed elections against the Communists in Italy, oversaw the coup against President Diem in Saigon, and ran the controversial Phoenix Program in Vietnam, which sparked today’s legacy of counter-insurgency. But after decades of obediently taking on the White House’s toughest and dirtiest assignments, and rising to become Director of CIA, Colby defied the President. Braving intense controversy, he opened up to Congress some of the agency’s darkest, most tightly held secrets and extra-legal operations.